Travertine terraces, Yellowstone, Western USA, Fall 2005. After a month’s absence because of the Fukushima interviews, I am resuming the geology word of the week. For my new readers, every week I blog about a geology word. Over the past several months, I have been working my way through the alphabet, from A is for Alluvium to S is for Speleothem. I hope you enjoy this weekly feature! 2. Translation of the above + a little more: A type of limestone (a calcium-rich rock composed primarily of the CaCO3 minerals calcite and aragonite) which forms by chemical precipitation (the stuff that makes the rock falls out of solution) from certain types of shallow or surface waters, such as springs and rivers. The trigger for the precipitation is usually gain or loss of carbon dioxide (CO2), which causes a pH change and changes the solution chemistry so that CaCO3 precipitates. This gain or loss of CO2 usually happens very close to the Earth’s surface as the CO2 is lost to or gained from the atmosphere. The waters that produce travertines are usually very acidic (low pH) or very alkaline (high pH). Often, travertines precipitate from acidic hotsprings, such as those at Yellowstone in the Western USA. 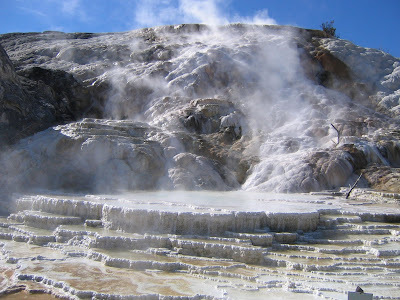 However, contrary to many web sources (this wikipedia article, for instance), travertines do not always form at hotsprings; they can also form from cooler waters. Closely related to the word travertine is another T word: tufa. The difference between travertine and tufa is porosity– tufa is a type of highly porous travertine that generally forms from cooler waters (not hotsprings). If you’re not a geologist– and even if you are– you might associate the word “travertine” more with fancy tiles and kitchen countertops than with geology. That’s okay– travertine tiles and countertops can be very beautiful. Personally, I’d love to have some gorgeous travertine in my kitchen or bathroom. Since I work on travertines as part of my PhD, such tiles and countertops would be part of my geology dreamhouse. However, perhaps it’s best that I don’t have any travertine in my kitchen. If I did, every time some poor houseguest complimented me on my beautiful kitchen I’d probably subject this poor person to a long lecture on just how amazing travertine is scientifically and what I’ve learned from studying travertines in Oman. I’d probably go on to excitedly point to a small layer or feature in a tile and bemoan how some of the textural characteristics were lost when the piece of travertine was polished to make it into a tile. Since my soon-to-be husband is also a geologist, he’d probably join in on the discussion and we’d scare away our poor houseguest. Travertine bathroom. Image taken from here. However, the value of travertine goes beyond the economic value of certain types of travertine as ornamental stones. There is also much scientific value that can be gleaned from studying travertine. Also, I’d argue that the beauty of seeing many travertines in their natural environment– no polishing– goes far beyond the beauty of any travertine tile or countertop. At least for me, anyway. There are many good scientific reasons to study travertine. For example, study of carbon and oxygen isotopes in travertines (especially speleothem-type travertines that form in caves) can provide a chemical record about how the climate of a region has varied in the past. 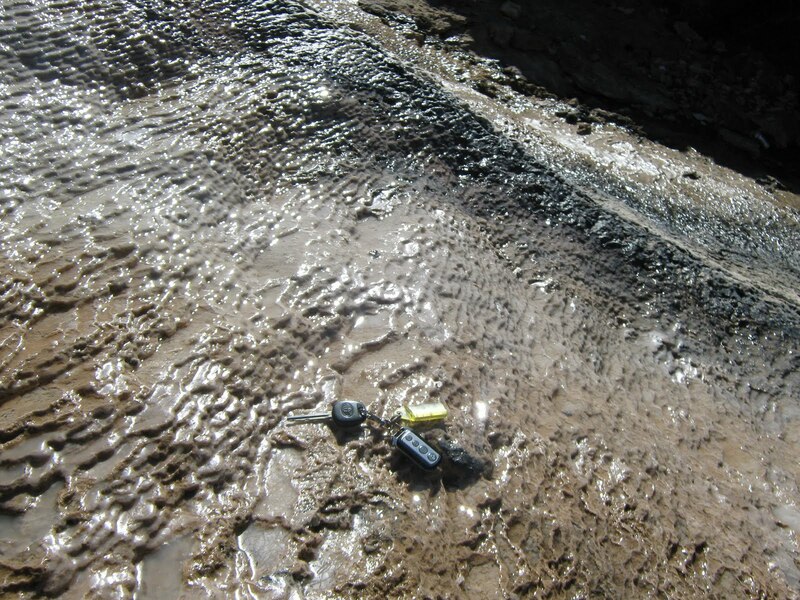 Study of travertines and the fluids from which they precipitate can also provide information about shallow groundwater. Since many travertines form from high-temperature springs (often heated by magma, such as at Yellowstone), study of these types of travertines can provide information on a volcanic system, such as water-magma interaction. As I mentioned in the definition above, travertines usually precipitate from either very high pH or very low pH waters. Study of the critters (bugs and fishy things and microbes) that hang out in these extreme pH environments provides interesting information about life in extreme environments, which might provide helpful information relevant to looking for life on other planets and figuring out the origin of life on our own planet. 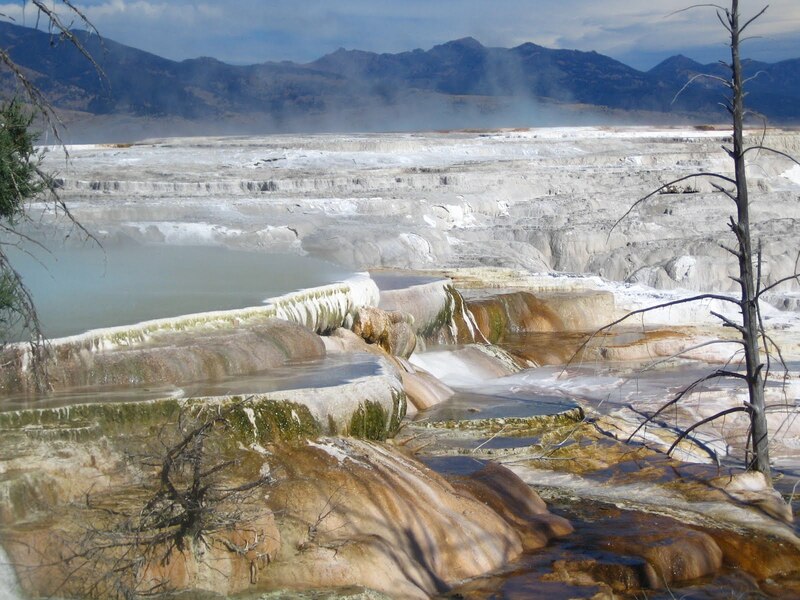 These are just a few of the ways that studying travertine is scientifically valuable. Why do I study travertine, you might be wondering? Well, I study travertine because I am interested in learning more about how travertine interacts with atmospheric CO2. As many of you know, CO2 is a greenhouse gas that contributes to global warming. Humans release CO2 to the atmosphere through burning of fossil fuels. There is currently much effort being put forth around the world to investigate how we can reduce anthropogenic CO2 emissions and– maybe– even geoengineer our environment so that we can remove CO2 from the atmosphere and store it in another reservoir, such as underground in an abandoned oil well or a porous sedimentary layer. (Opposite of) travertine formation through degassing of CO2. Reaction taken from Pentecost (2005). Travertine formation through uptake of CO2. Reaction taken from Pentecost (2005). If you think about it, this is really, really cool! Travertines that form in this manner are naturally sucking up CO2 from the atmosphere and storing this CO2 in solid rock– travertine. For my thesis research, I am studying the formation of such travertines from very high pH (highly alkaline) natural groundwaters (most are pH = 11-12) that occur in peridotite rocks in Oman. Very high pH groundwaters are rare, but they are found at several places around the world. Below are some pictures of travertines I’ve encountered in my geology travels and research. The Omani travertines are my favorite. 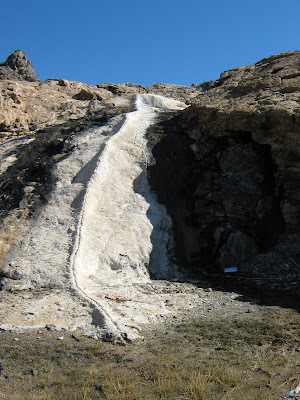 I think the newly-formed travertine looks like snow in the Omani desert. Click on any of the pictures below to view larger. A final note: I really like the first definition above, which I took from a book called “Travertine” by Allan Pentecost. I like this definition because it is very specific, descriptive, and inclusive. However, this type of definition is probably daunting for the non-geologist. A common problem with definitions of scientific words is that they contain more scientific words. As a geologist who works on travertine, I am familair with the other sciencey words such as “aragonite”, “mouldic”, and “vadose.” However, I can see how a non-geologist might struggle with the first definition of the word travertine. In the second definition, I have tried to define travertine in plainer language. 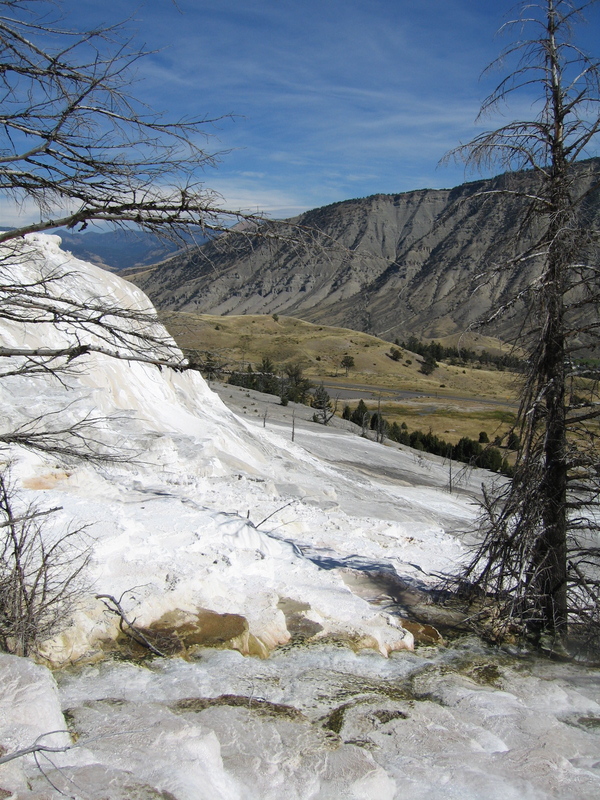 Travertine terraces engulfing trees, Yellowstone, Western USA, Fall 2005. Travertine precipitating around a tree, Yellowstone, Western USA, Fall 2005. 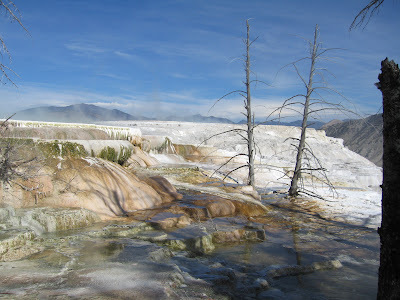 Travertine engulfing civilization, Yellowstone, Western USA, Fall 2005. More travertine! Yellowstone, Western USA, Fall 2005. 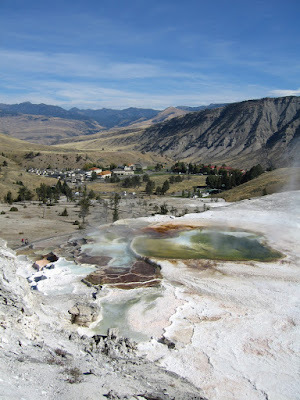 Closer view of travertine terraces, Yellowstone, Western USA, Fall 2005. 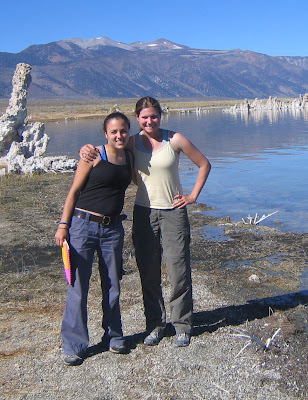 Geology students with tufa towers in the background, Mono Lake, California, Fall 2005. Layers of travertine time, Oman, January 2009. Sitting atop some travertine, Oman, January 2009. Investigating some more travertine, Oman, January 2009. Travertine coating an alkaline streambed, Oman, January 2009. Travertine coating a soda bottle, Oman, January 2009. 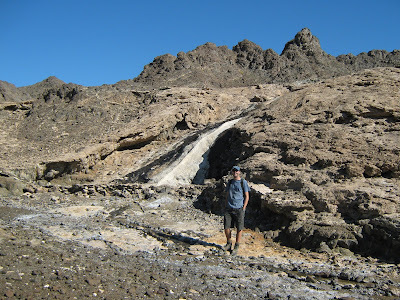 Travertine precipitating from an alkaline pool (geologist for scale), Oman, January 2009. Travertine tower, likely formed from an alkaline waterfall (geologist for scale), Oman, January 2009. Very large travrtine deposit, note the tower (see above picture) to give you a sense of scale, Oman, January 2009. Alkaline streambed, Oman, January 2009. Older (brown) and newer (white and black) travertine, Oman, January 2009. Standing around an alkaline pool, Oman, January 2010. Little travertine terraces, Oman, January 2010. Older, brown travertine deposit, Oman, January 2010. Older travertine (brown) and newer travertine (white and black), Oman, January 2010. Unusual travertine morphology, Oman, January 2010. Mini travertine terraces (car keys for scale), Oman, January 2010. Large travertine deposit (locals have controlled the alkaline stream in a cement pool), Oman, January 2010. Travertine terraces outlined, Oman, January 2010. A tower amidst the travertine, Oman, January 2010. A tower amidst the travertine (with labels), Oman, January 2010. For more pictures of Omani travertine, see here and here. -Pentecost, Allan. Travertine. Berlin: Springer-Verlag, 2005. Neat stuff. But what makes some Travertine white and other Travertine black? Some change in mineral content, I assume – but what? 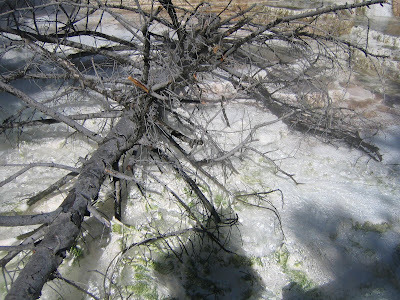 LeecL: It's most likely a biofilm– something living on the freshly-formed travertine.